Triggers and Actions don't live in isolation. They are always attached to some element of your experience. This element can be an asset, a control, a collection or a scene. To select and configure triggers and actions for a given element you must first select that element either in the Scene Editor or in the Scene Structure panel. When an element is selected, the Triggers and Action panel - located to the bottom-right of the Composer - will display all trigger and action sets already configured for this element. (A "set" is comprised of one or more actions for a given trigger.) This area is also the place where new sets can be created. 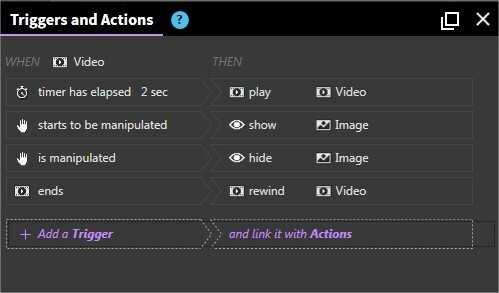 To create a new trigger/action set, press the the Add a trigger + button in the left of the Triggers and Actions panel. 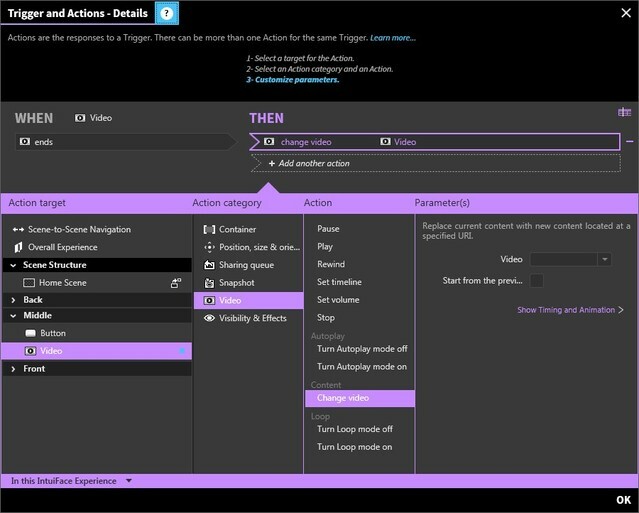 This Details panel is displayed when creating a new trigger/actions set or when an existing trigger/actions set is clicked within the panel. It enables you to select and configure a trigger as well as add one or more actions that will be executed when this trigger is activated. The Details panel is composed of two sections. At the top is the trigger clause (WHEN) and the action clauses (THEN). Using your mouse, select the side you wish to configure. The bottom section is used to specify trigger or action details. Only triggers and actions relevant for a given element will be available. A comprehensive list of triggers can be found here. For each trigger you can apply one or more conditions to be evaluated before the trigger is activated. This will enable you to conditionally execute actions associated with the trigger depending on the value of other asset(s) properties. For details about all of the available actions, read Actions overview. Actions can apply to the local experience or to a remote experience. Please read Creating remote actions in Composer for details about creating remote actions within Composer. A comprehensive list of actions can be found here.